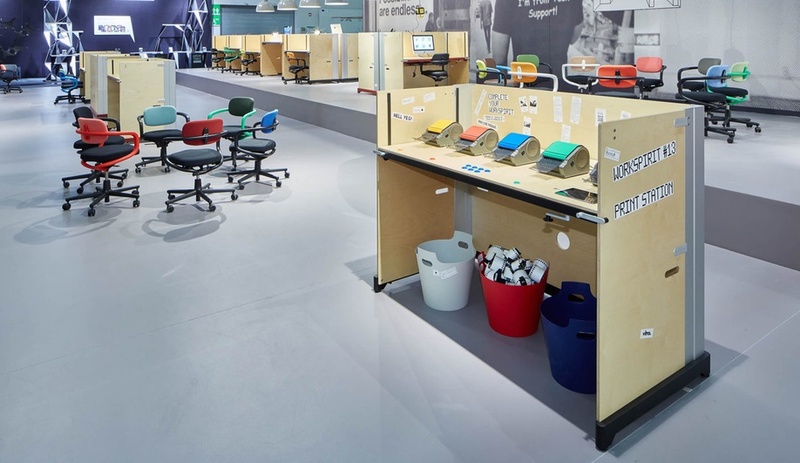 The Orgatec tradeshow, which recently wrapped its five-day run in Cologne, offered a sense of what we can expect to see in contract furnishings in the coming years. Below, a peek at some new ways of working from De Sede, Vitra, Muuto and more. We’ve already written about Koleksiyon’s eye-catching Oblivion system, but they haven’t forgotten offices without the space for such monumental installations. Their Borges desk system relies on an unusually narrow spine that’s not really intended to be used as a primary work surface. 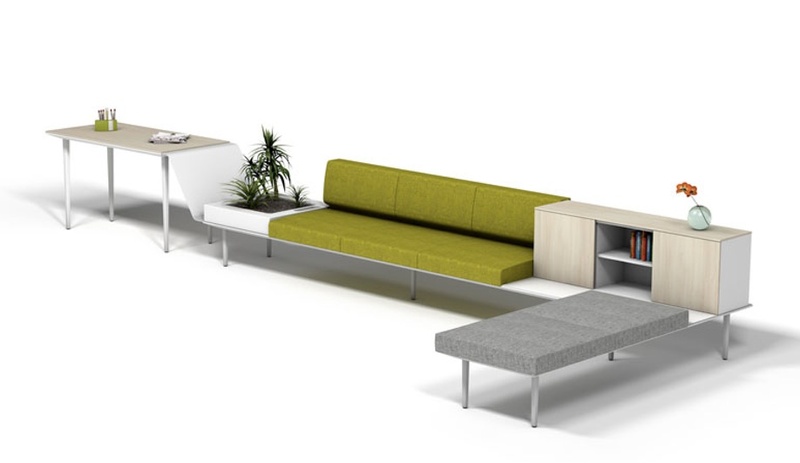 To this axis, a designer can attach modules of different types – including freestanding tables, V-shaped desks that maximize space for shared work surfaces, and the hooded “Cap,” which provides just enough room for a single work station in a semi-enclosed space. After touring a string of rapidly expanding startups in Silicon Valley, designer Konstantin Grcic was struck by their need to deploy new office spaces seemingly overnight. 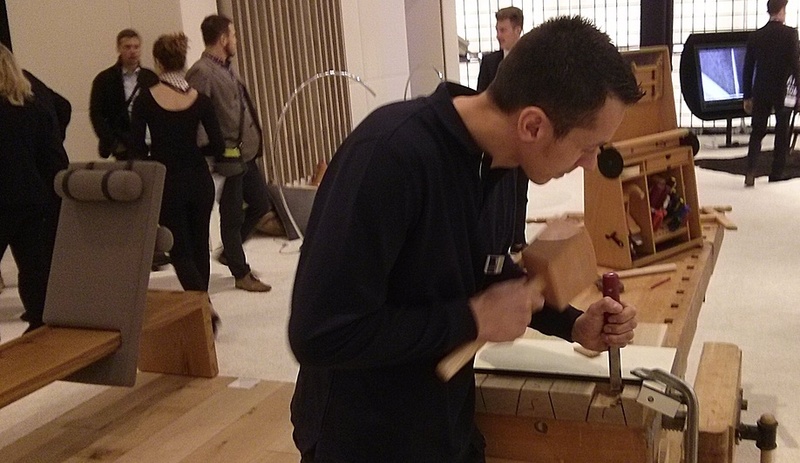 His solution: a desk that can be collapsed into a vertical unit just a few centimetres deep when not in use, then rolled into place and set up in a matter of minutes. 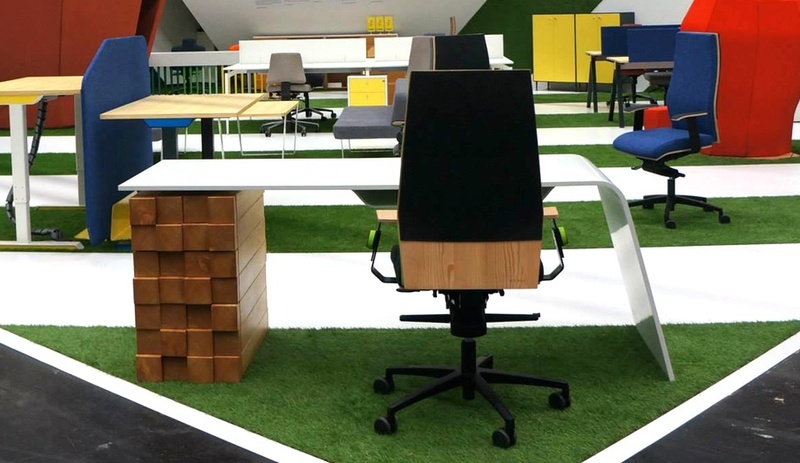 A crank allows the desk height to be easily adjusted for sitting or standing, while the blank plywood is intended to serve as an enticing canvas for young workers, encouraging them to personalize their desks. 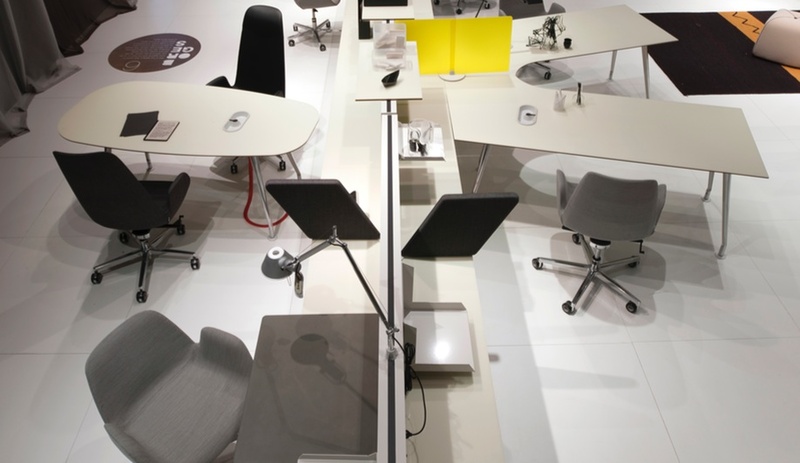 Many of the companies exhibiting at Orgatec placed an emphasis on the changing ways we work – shifting from solo work to collaborations or presentations and even simply lounging throughout a single day – and presented different takes on a modular system able to accommodate all these styles of working. Actiu’s Longo exemplifies the trend, combining storage, benching, a sofa and a worktop into a modular system that can be endlessly rearranged. 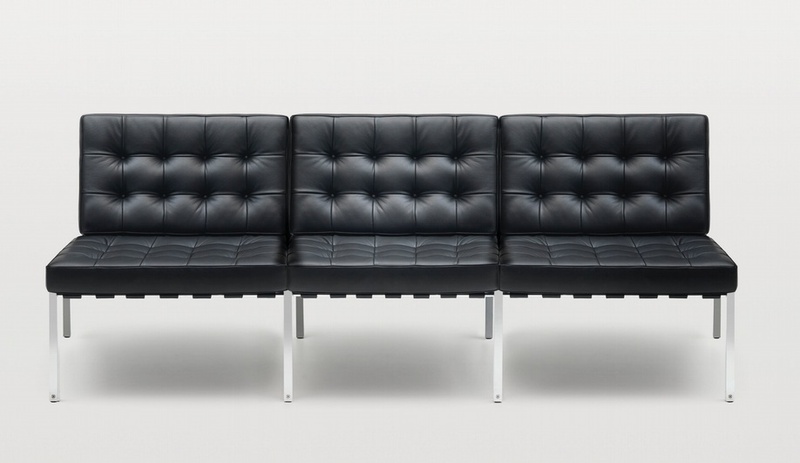 While many of this year’s exhibitors were looking ahead, a surprising number looked into the past for inspiration as well, re-introducing collections from the 1940s and 50s – primarily lounge seating for lobbies and waiting rooms. De Sede, for one, revived Kurt Thut’s 1956 KT-221 chair, a classic steel and leather mid-century number that can now be ordered with custom finishes. To illustrate the trend of capturing a residential feel in a workplace, Orgatec invited a handful of designers, including Sebastien Herkner, Raw Edges, Ineke Hans and Stefan Diez, to conceive working environments that accentuate the comforts of home. 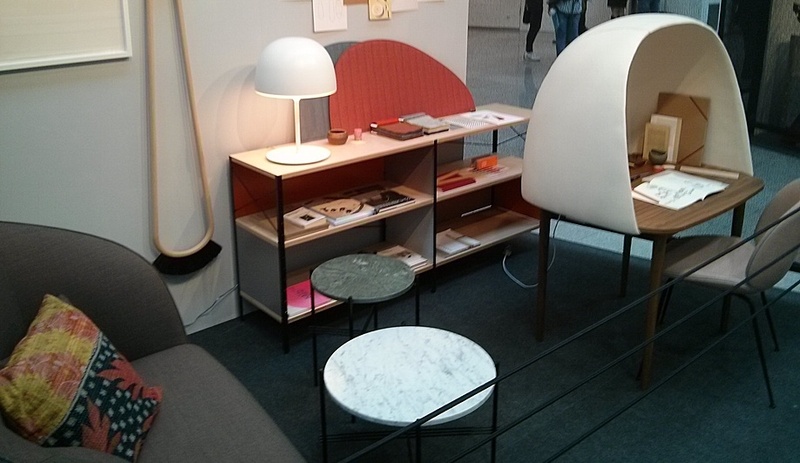 GamFratesi’s cozy booth includes a number of products designed by the Copenhagen-based duo, including Rewrite, a cozy desk for Ligne Roset that’s topped by an upholstered hood, and the marble-topped TS tables introduced at Orgatec by Gubi. One of the most eye-catching booths belonged to Germany’s Schneeweiss, representing four manufacturers of furnishings for the hospitality industry, which set up shop in a structure made from glowing gabion-like cubes. There was much to see inside as well, including Hiller’s bark-seated Atlanta 2.0 occasional chair; Rosconi’s Lilith, a pickpocket-resistant cafe chair; and a demonstration of the hand-chiseling technique used to manufacture Rosconi’s sturdy Core benches (a final version can be seen at the left). Another unmistakeable trend: the gradual linking of everything in the office. 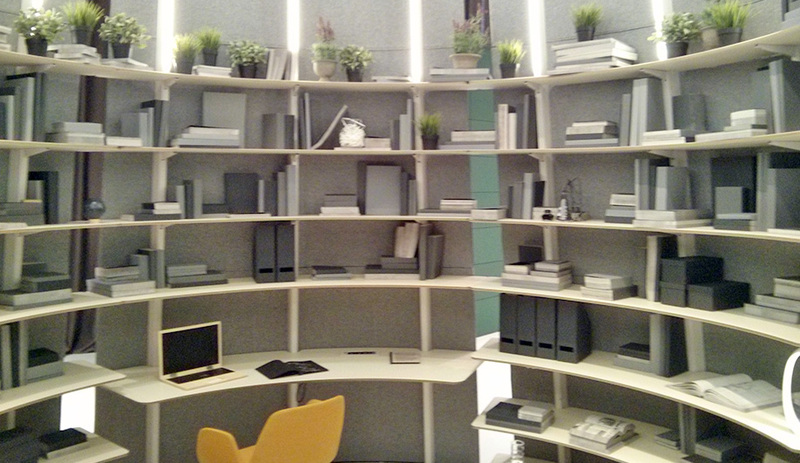 Nurus of Istanbul’s entire lineup of launches came ready for all the technology you could to throw at it; among the options on view were a desk controlled by Bluetooth that can automatically lock and unlock based on the user’s proximity, and inductive charging stations hidden in the surfaces of various fixtures. 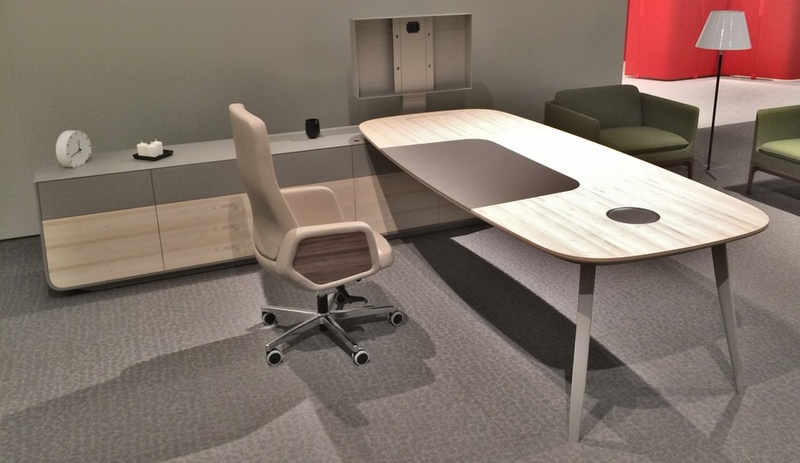 The Ashbury desk designed by Stefan Brodbeck, above, hides a control panel that is revealed by simply swiping a hand across the surface, while a frame for housing a monitor can also be lowered into the attached side storage when not in use. 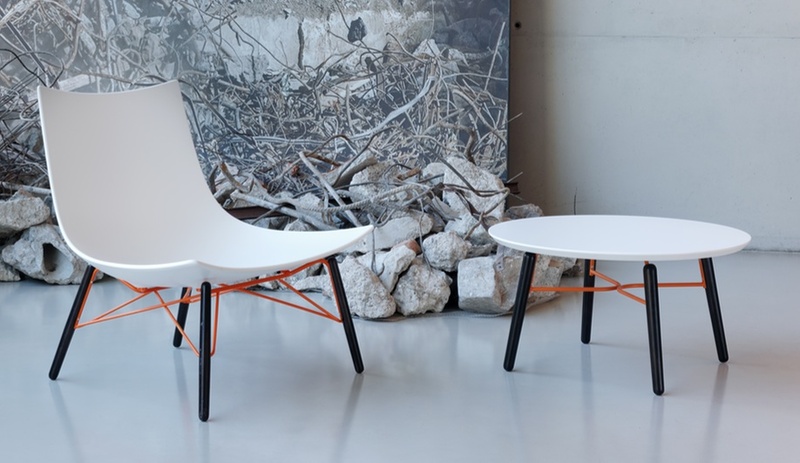 Lorenz+Kaz’s lounger for Rossin combines a generous seating area with interchangeable legs – options include bent steel, a four-point swivel base and wooden legs combined with three different styles of metal truss – to create endless options, adaptable to a range of contract settings. 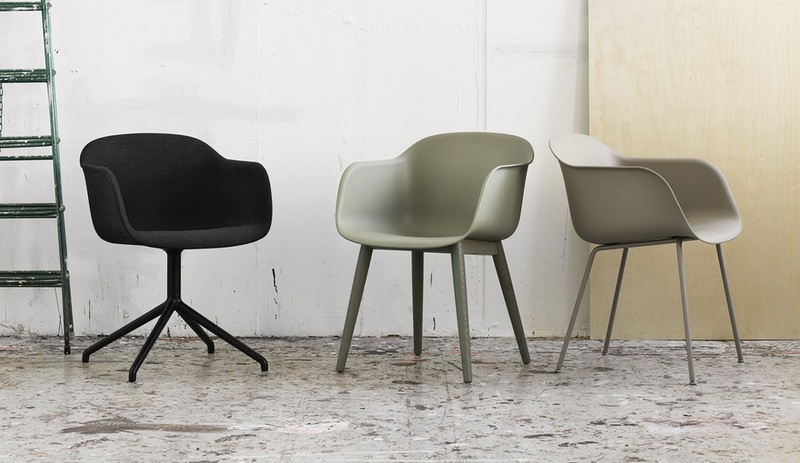 The polyurethane shell can be fully upholstered, or simply softened with the addition of a removable cushion. In a similar vein, the Fiber Chair, designed by Iskos-Berlin for Muuto, combines a rigid armchair shell with an assortment of bases and upholstery options. For the shell, the designers chose to mould the fuss-free shape from an environmentally conscious material that marries recyclable polypropylene and wood fibre. Slovenia’s Donar showed off an impressive range of chairs, partitions and even a room-in-room, all durably upholstered for acoustic dampening and wired with Bose sound systems. But the sleekest item on display was Desna Hemisfera’s prototype for the Katedra desk – seemingly just a curving Kerrock top resting atop a stack of wood. The practical considerations are hidden: a shelf suspended beneath the desktop hides a keyboard or laptop when not in use, the wooden section camouflages three push-to-open drawers, and an inductive charging station hidden in the desktop invisibly repowers handheld devices – when the indicator LEDs embedded in the desktop change from red to green, your device is fully charged.